“The Proposal” and “The Bear” featured Bret Kinslow, Sherry Pikul and Aaron Schuerr. Marc Beaudin directed. “On the Harmful Effects of Tobacco” featured Marc Beaudin. Sherry Pikul directed. Set design by Marc Beaudin. 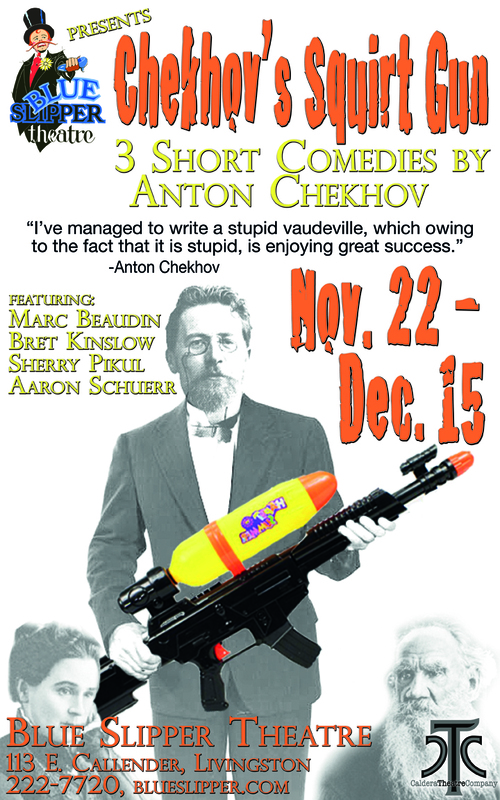 “Chekhov’s Squirt Gun” is the title given to a collection of three short comedies by the Russian master playwright Anton Chekhov, presented by the Blue Slipper Theatre from November 22 through December 15. Evening performances, with doors opening at 7:30 p.m. for an 8:00 curtain, will be held Fridays and Saturdays, November 22 and 23, December 5, 6, 13 and 14; as well as a special pre-Thanksgiving food drive performance on Wednesday, November 27. Matinees will be held at 3:00 p.m. (doors at 2:30) on Sundays, November 24, and December 8 and 15. The pieces include “The Proposal,” and “The Bear” directed by Marc Beaudin and featuring Bret Kinslow, Sherry Pikul and Aaron Schuerr, and a comic monologue, “On the Harmful Effects of Tobacco,” directed by Sherry Pikul and performed by Marc Beaudin. All four performers are members of the newly-founded Caldera Theatre Company (CTC), an independent workshop/performance group offering alternative, challenging, classic and original productions. More information on the CTC can be found at calderatheatre.com. The Blue Slipper Theatre is located at 113 E. Callender in downtown Livingston. Tickets are $12 ($10 for students and seniors). Donations of non-perishable food items and/or monetary gifts will cover admission for the November 27 performance, with all donations being distributed to Livingston food banks. Reservations are encouraged and may be made by calling the Blue Slipper Box Office at 222-7720.